April is Autism Awareness Month. Today, we’d like to introduce you to just some of the many bloggers who write about autism on WordPress.com. How can we expect that snotty woman behind us in line at the grocery store to know that our daughter is not just an out-of-control three-year-old, and it’s also not us just being ineffective parents? The truth is, we can’t expect people to take autism seriously unless they know what it’s like to love someone with severe autism or be someone with severe autism. Over at Living With Autism , blogger, teacher, and poet Liz shares the challenges and celebrations of caring for her adult son Dylan, who has autism. Liz reflects on early interventions for Dylan and the risks and rewards of new experiences. Through her poetry, Liz considers how her perceptions of autism have shifted through the years, as Dylan grew older. Her ethical statements about blogging about a man who is unable to give informed consent in the traditional manner helps educate readers and raise awareness of living with autism. Leah Kelley is a Canadian special education teacher and parent of an autistic child. She created Thirty Days of Autism to promote social understanding and offer a glimpse into the perspectives of those whose lives are touched by autism. In addition to blogging prolifically, Leah speaks on autism and education. In fact, she’ll be presenting on Supporting Transition to Adulthood for People on the Autism Spectrum at the Council for Exceptional Children’s 2014 Convention & Expo, in Philadelphia, Pennsylvania, from April 9th – 12th. 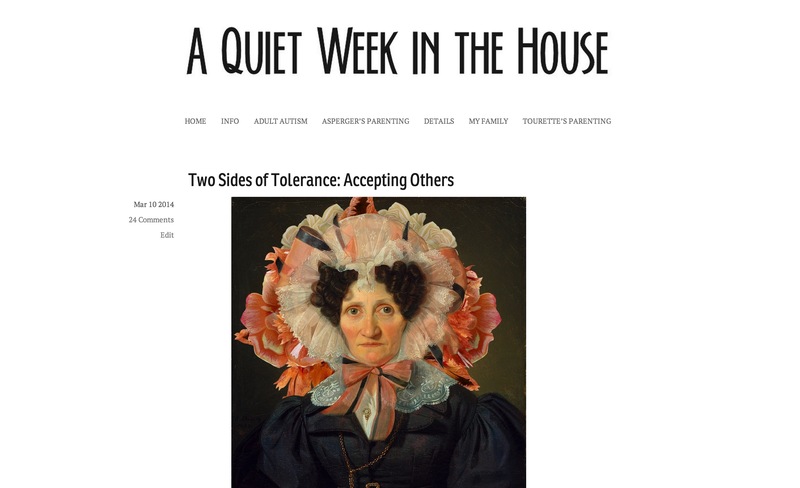 Over at A Quiet Week In The House , blog proprietess Lori writes about being autistic. To learn a little more about her, read this humorous entreaty for olfactory political correctness on behalf of the scent-sensitive and this loving tribute to her grandfather. As an autistic woman, I cursed both my sensory sensitivity and social reticence. I wanted to explain my huff, but I had neither the words nor the poise. Perhaps the perfume she wore was her stim, her comfort, her way of making the outside world tolerable. Sitting close to me was an act of camaraderie, not hostility. Interested in learning more about autism? Be sure to check out the autism tag in your WordPress.com Reader. You’ll find — as we did — a passionate and compassionate community of people willing to educate, share, and sometimes, just listen. This is very moving! As a therapist I see a lot of parents really struggling to parent their child with autism! Wow! Cool! I am writing a series of short stories about Autism. 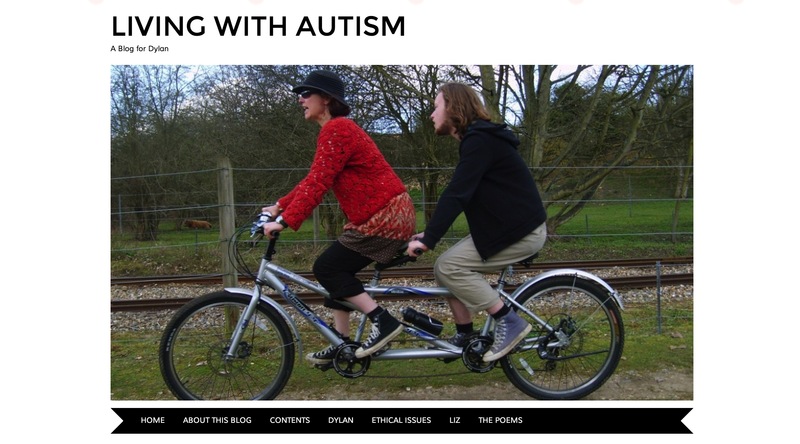 Great to read other bloggers who are parenting autistic children too. It can be a very isolated world for a parent so it’s nice to have feelers out there and months like this to raise awareness and connect individuals. Unfortunately many of our autistic children are misunderstood. Because of this, when they become adults they end up in our nations prisons. I am glad you are taking this month to educate folks about autism. It is common for us to fear those things we do not understand. Hopefully this month folks will get a better understanding of the autistic person and learn to better deal with them rather than to fear or detest them. Incidentally I have a teenage grandson with Asperger’s. He is a great big brother to his two younger siblings, and a terrific artist. His public school teacher has a special wall in her classroom for his drawings of historical characters the class has been studying. The class makes comments on them much like on Facebook. Thus far all such comments have been complimentary. Life is not so much the hand we have been dealt, but much rather how we play it. Absolutely. I have a twenty year old son with autism who is now learning to make his way through college where no one really understands him. It is a painstaking road as have been most in his life. But he has come so very far from when he was a small boy. I am a teacher support, and for three years I have had the good fortune to live in the school hours, with an autistic boy. It was an experience not easy, but exciting! Autistic children are the champions of the absolute. Thank you for sharing! I have an autistic son and so many do not understand his perspective. They think he is just being a “bratty” kid. What they don’t understand is that every word spoken and every action taken is taken literal. Both great blogs, however it would be refreshing to see blogs about those that have high functioning autism with aspergers. While the children (including my 10 year old son) are exceptionally brilliant and well spoken; the social ineptitude combined with OCD that can cause severe violent meltdowns from children that otherwise have a heart of gold and would never hurt anyone intentionally…. well sometimes it is parents like us that feel the most alone and forgotten in the autism spectrum. I firmly believe autism must get a better and more possitive visibility in our society and all of us as parentes, teachers, health professionals, journalists, writters, bloggers and artists can help creating healthier and more compassionate perspectives to share in our communities and the society at large. I am very pleased to find these blogs featured here! Thank you for sharing these blogs and promoting autism awareness. I am quite aware of autism as I have a 20 year old son who has not only autism but also Down syndrome. Nick makes everyone aware of autism and often in a big way (all 30 fire alarm pulls since the 3rd grade). 😉 More about Nick, Down syndrome and autism @www.nickspecialneeds.wordpress.com. Thank you so much for posting these links, my brother is severely autistic and I will be having a read of these blogs- I’m new to blogging and would like to create a blog on autism of my own, good to know there are blogs on autism out there! Great stories, thank you. The support, information, overall awareness and individual stories that have been allowed to have their own voice thanks to the internet have helped to create a community that otherwise may not have existed. I am the 62 year old mother of a 35 year old son (Scott) with relatively high functioning Autism and Tourettes. I have always believed offering him opportunities outside of the standard system, and through the ups and downs I feel that all who know Scott and Scott himself have been rewarded by this, with Scott becoming a known and accepted character in his local community. I am now about to step out of my comfort zone of the corporate world and with Scott, completely out of his comfort zone, go on a 4 or so week caravan trip following the Murray river here in Victoria, Australia, just the two of us. My main objective is to reconnect with my son, but to do so in a way that we both must learn and adapt as we go, we plan to create art as we travel (scott is a reasonably accomplished artist in our local area) and hopefully on our return sell our works in an exhibition with all profits going to organisations that directly help families with autistic children and adults in their own communities, here in Australia. I am very nervous with anticipation knowing this could all blow up in a matter of days or could be a life changing adventure for both of us. I hope to have Scott video blog about our experiences of the the ups and downs of our journey and I will also document our experiences in my business blog found at http://cresultsskincare.wordpress.com/ under the title ‘Pushing the boundries’. Please feel free to follow our story, both leading up, and with a planned date of May 5th to ‘hit the road’ as we embark into the unknown. Just today, my sweet little 21 month old granddaughter was recommended by a panel of 8 child psychologists, for 5 day a week 3 hours a day intensive in-home therapy because they suspect she has autism. Though they won’t officially diagnose her for another year, they want to begin early intervention now. I was just processing all of this information when I opened my email and found this blog. I don’t think my granddaughter has autism but I’m very grateful for the information, the supportive community and the programs out their to help these children be their very best and if I’m simply in a stage of denial, which I don’t discount at all, then I’m certain I will need plenty of support and advice if a new reality is in my very near future. I, too am what I like to call a perma-parent. My son is autistic (PDD-NOS) and Deaf and intellectually disabled. Online perspectives are all I can access because my son goes to school out of my county (Philadelphia,PA). Autism awareness and acceptance is crucial to healthy development of our children. It starts with us parents and I hope it ends in a world where large autistic children can play freely at a playground and not scare the other children. I’ve been writing about autism on wordpress since 2009, and in 2010 began a blog specifically devoted to “a life punctuated by autism”. It’s called I Wouldn’t Have Missed It and it’s really just snippets and observations from our lives over the past 18+years. Challenging? Sometimes. But I really wouldn’t have missed it for the world. I have Asperger’s Syndrome and have two blogs on WordPress.com. One is called Outside In http://yechristian.wordpress.com and http://uncommonbostonian.wordpress.com. Please, check them out. I was diagnosed when I was an adult. When I was child, everyone around me had no idea that I was autistic. They thought I was just different or rude. I wonder if one day we’ll ever look at autism as a special blessing? Without the negative stigma, wouldn’t these children and people be better understood and respected… I’m sure there are beautiful things about them and their lives and in their minds that the non-autistic will never experience. We should appreciate and seek to learn from them, I think. Having an autistic child in our family, thank you for sharing your thoughts with us. Kane, I’m with you on the Aspergers front. I have a 23 year old son who’s just come home to live with us again temporarily after discovering the trials and tribulations of being ‘independent’. Over the last 3 years we’ve rescued him from people who’ve stolen everything he owns, extracted him from a family who told him the devil lived in him and he was to burn all his precious books on volcanoes (his passion), which he duly tried to do poor thing, but also seen kindness come from the least expected quarters. There is no stopping an Asperger’s teenager when they decide they’re going to leave home and be independent, and it is the most traumatic thing to experience as a parent. Almost as traumatic as discovering him being bullied by a mob of kids at school, or seeing how lonely he is at times. But he has now successfully lived with others for over a year, learnt how to look after himself and we’ve not had to rescue him from unsavoury situations in that time. So there’s always hope. If anyone knows of good blogs to follow about parents of Asperger kids (and adults), I’d be keen to hear about them. I am a parent who just began blogging about the joys and the trials of parenting my son. He is 11 years old, has a killer sense of humor, the best smile and also happens to have High Functioning Autism (Aspergers Syndrome) and Generalized Anxiety Disorder. I would love for you to join me on this journey at Not The Former Things here on WordPress. Thank you all for sharing your stories. I am so very encouraged and excited about the future! I am majoring in Speech language pathology & audiology with a special ed concentration. The lighthouse of my life is children/adults with disabilities, especially autism and Down syndrome. This was very helpful.. Thank you! Here’s a link to our blog where I share our journey of healing, hope, faith and happiness!